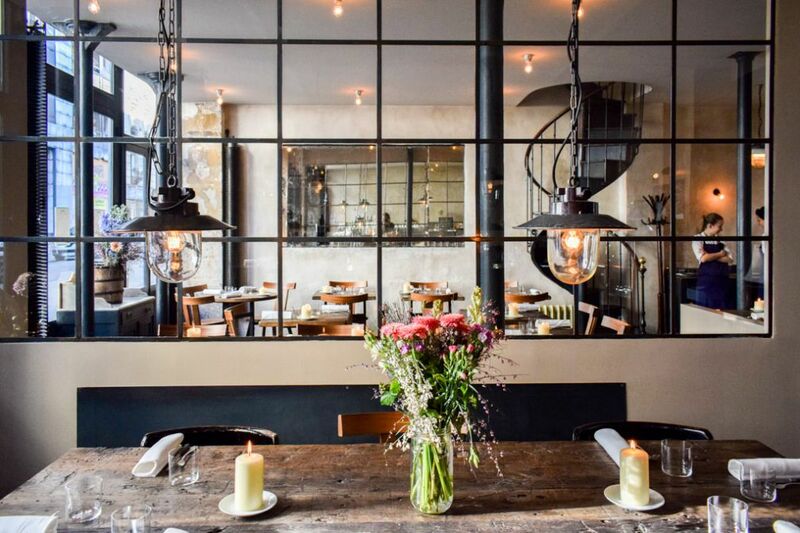 Septime – from the Latin septimus, seventh, is Chef Bertrand Grébaut’s Paris restaurant where he seeks to liberate good French food from expensive dining rooms. Chef Bertrand Grébaut has a wealth of experience and deep roots in honouring simple pure produce. 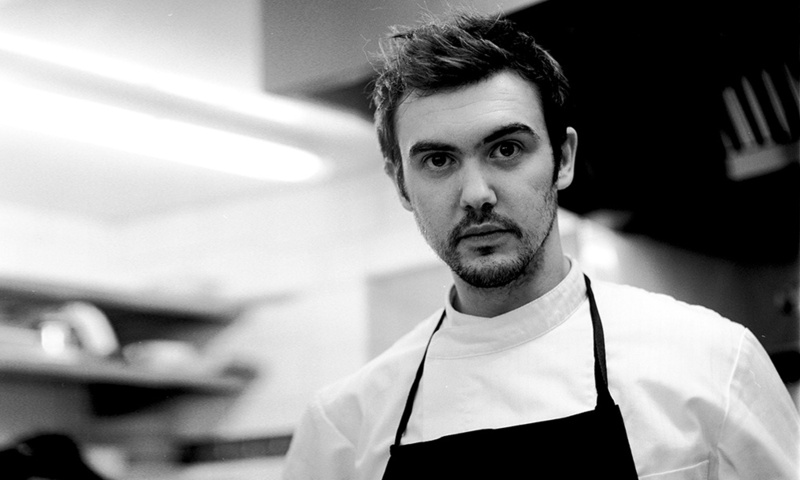 His style infused with the incomparable energies of Joel Robuchon and Alain Passard during his development as a chef. Here at Septime he serves a seven-step menu at dinner and four steps for lunch, focused on nature. For those who like lists Septime comes in at No.6 – Top 100+ European Gourmet Casual Restaurants – Opinionated About Dining 2018. Septime has achieved one Michelin star but interestingly pegged at number 40 on The World’s 50 Best Restaurants 2018 list and I am excited to find out why. Earthy decor with mud rendered walls small tables made from what looks like thick old recycled slabs of timber and the simple curved lines of bentwood chairs. It has a casual bistro feel which surprises me given its place in worlds top 50. We sit against the wall below a huge set-in mirror. So despite having my back to the room I can discretely observe the goings on behind me. I kind of like it. And of all people who should we spot in the mirror? “Hang on a minute” my love says “I think that’s Vladimir Mukhin” and indeed, there with a group for lunch is the distinctively coiffed and bearded Russian, creative force behind White Rabbit, number 15 on The World’s 50 Best Restaurants list where one can dine on such things as moose lips and swans livers! The big bold energy coming from that table adds to the upbeat fun vibe here. People are just here to have a good time. We begin our adventure with crispy crunchy home made crostini served with cream and cheese. Nom nom nom…all the words disappear, replaced with primal grunts of satisfaction as we lap up tonguefuls of happiness. 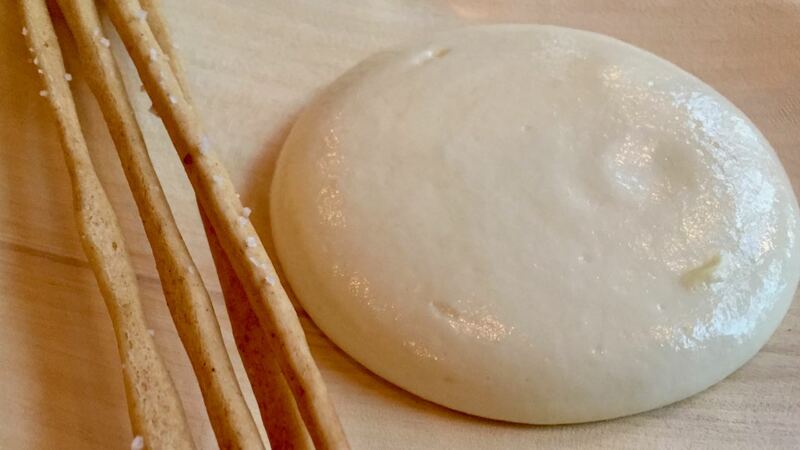 The only frustration the skinny crostini sticks clearly provided to slow down the scooping up of creaminess. And that the little puddle of joy disappears so quickly. What a stunning delicious little nibble while we contemplate what is next. The four step menu is a surprise with only a choice of meat or fish. Oh how tricky, we can’t choose, so we decide on ordering one meat on fish and comparing notes. 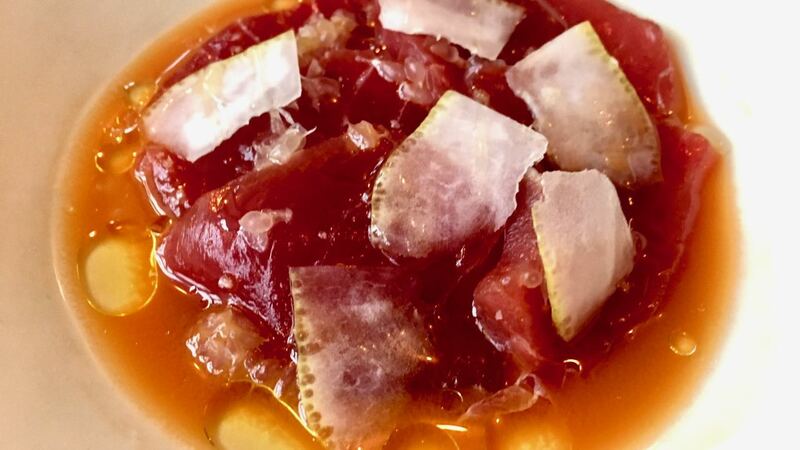 The first plate, glorious deep pink raw tuna, so simple. Slices of tuna bathed in Mediterranean carrot juice; fragrant notes of herbaceous citrus verbena. Dressed with camelina oil. A light nutty asparagus flavour that lightly coats each bite in glossy happiness. Then roasted cauliflower. A simple white plate and simple presentation. 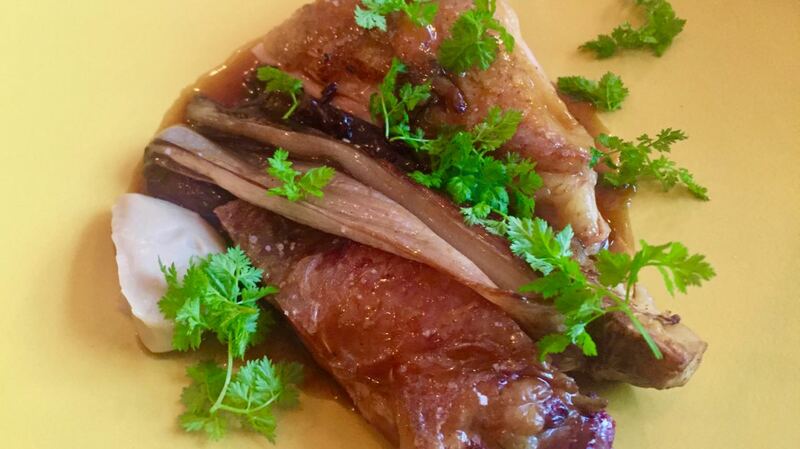 The cauliflower wrapped in silky translucent lardo from Gascon porc noir – the black pig. Bathed in the most divine smoked onion sauce, mustard, chives, cornichons. 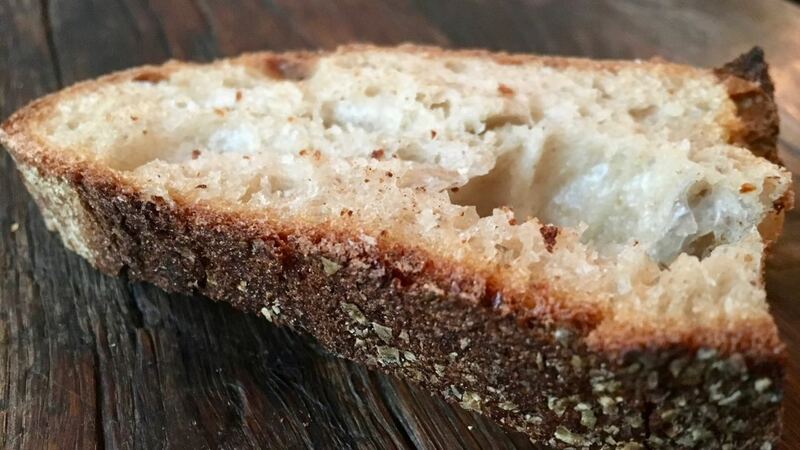 Our server plonked airy chunks of dark crusted chewy sour bread, rustically on the bare timber table top. Perfectly timed, I tear off pieces to sop up the spectacular onion sauce. I can’t possibly leave a drop on the plate. For our main course we had decided on one meat one fish. The fish is pollock, firm, sweet, robust fish that breaks apart into large flakes. 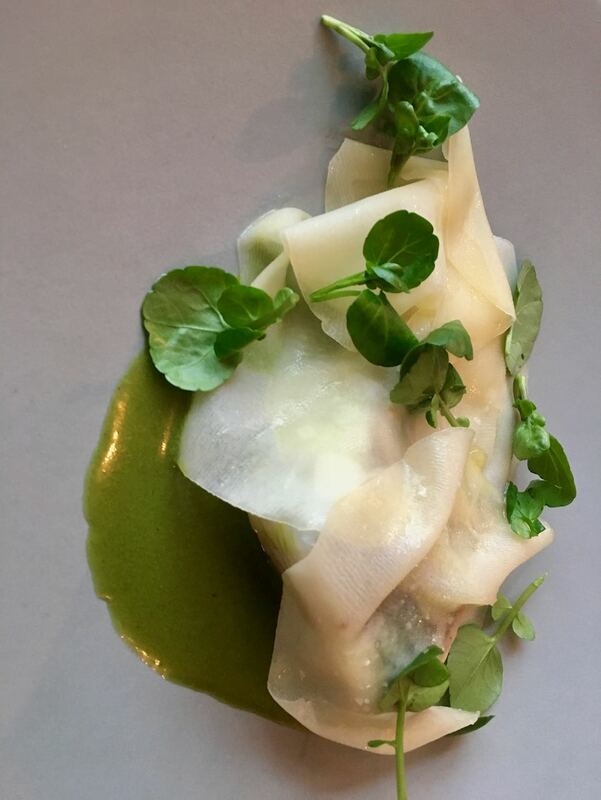 Draped in delicate folds of semi opaque shaved creamy white kohlrabi sprinkled with pops of peppery vibrant green watercress. 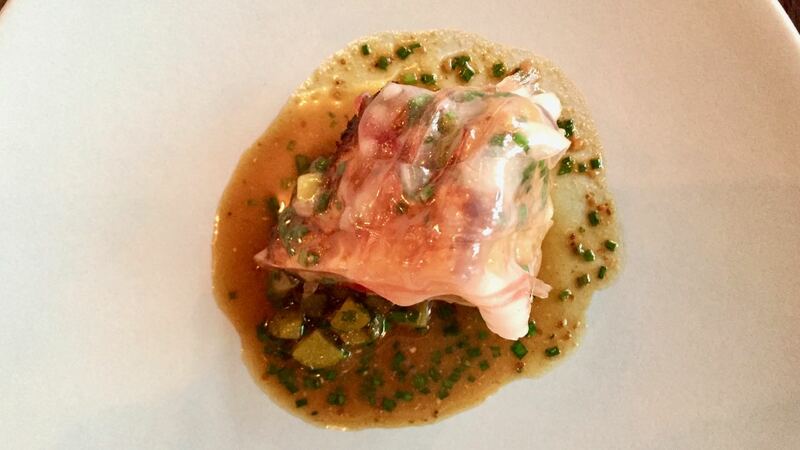 What beautifully structured textures and flavours – delicious. Guinea fowl, another first is our meat course. Dark golden crispy skinned slices of meat, moist, sweet with a gorgeous gamey depth of flavour. Each bite dipped into a tantalising anchovy paste, swooshed through glossy juniper studded jus and lifted beautifully with bright green torn leaves of chervil. A simple, elegant and exquisite dish. Our final treat for the day is dessert. 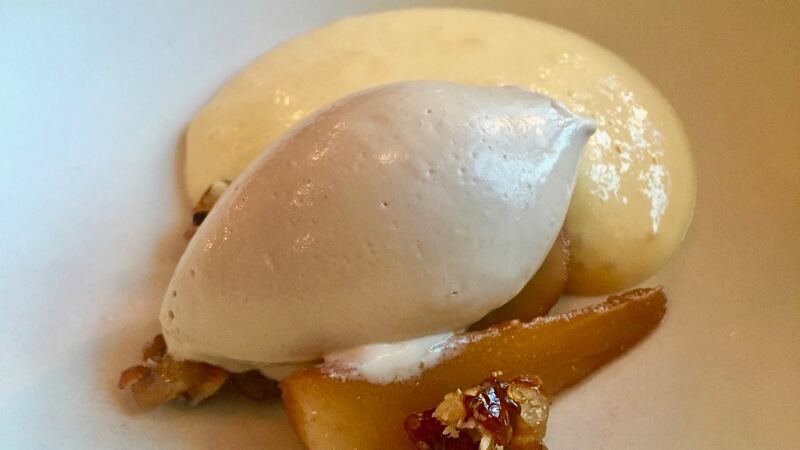 Poached pear sabayon, walnut icecream, toasty crunchy and smokey golden toffee walnuts. Layers, all I can think of is layers. Textures, tender, crunchy, creamy, smooth. Colours, deep golden brown, golden yellow and pale beige. Temperature, warm juxtaposed with frosty. Wonderful. I sense Robuchon’s cool modernity and Passard’s earthy honesty and purity in Chef Bertrand Grébaut’s approach. There is no question that the food is fantastic. I adore the casual easy approachable delivery, it all feels friendly and comfortable. Having now experienced a deeply textured and layered range of spectacular dining experiences, I wonder how Septime could possibly end up at number 40 on The World’s 50 Best list ahead of Schloss Schauenstein, one of the most glorious experiences in the world. I guess it’s a reminder that the lists, the reviews, opinions and perspectives are many and varied. None other than mine and my loves are important to me. It brings into sharp relief how very aligned my and my loves sensibilities are. The natural tendency to be drawn to innovation and creativity. An intrinsic understanding that food, cuisine is a universal language through which every culture communicates love. Our ability to see moments of gratitude in every experience we share. Today has been another magical moment. Stars, lists, awards, whatever. We are happy.